SAP business warehouse production support is needed in a live environment it is important that you check the system performance regularly and make any appropriate changes.You want to test several BW tools that have been developed with this task in mind. Definition: An InfoPackage group is a collection of InfoPackages. 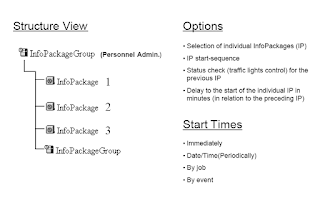 Use: During a data request, the scheduler is able to access InfoPackage groups directly, enabling it to request several InfoPackages at the same time.You process InfoPackage groups in the InfoSource tree in the Modeling or Monitoring area of the Administrator Workbench. 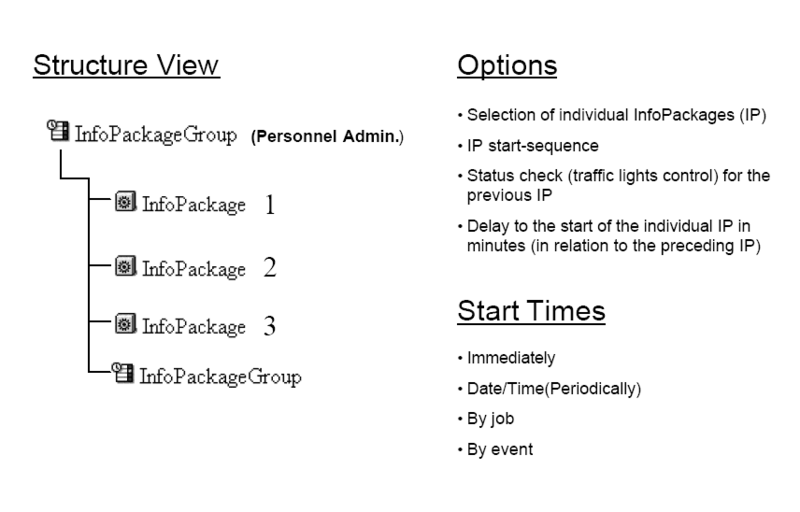 You can assign any number of InfoPackages to an InfoPackage group.You cannot assign InfoPackages with the same selection conditions, the same assignment to a combination of InfoSource / DataSource / or source system, or the same data type (transaction data or master data) to an InfoPackage group. In the Data Targets tabstrip in the InfoPackage, you can set different options for the automatic deletion of requests that have been loaded already. Event-controlled scheduling of jobs (processes). Definition :An event is a signal to the background processing system that a particular status has been reached in the in system.The background processing system triggers all of the processes that have been waiting for this event. Options:Successful completion of a process (subsequent processing) triggers a subsequent process and Determining event chains. You use events to control processes in BW. You determine these events under Tools - CCMS - Jobs - Maintain Event.For more information about event processing, see the The Event Concept and Event Processing section of the Basis documentation. Under Tools - CCMS - Jobs - Maintain Event, you have to create the events that you want to use to control processes in BW.Parallel processes run during event chain processing, so make sure that there are adequate backgound processes available. Subsequent processing (event is triggered) following the successful / unsuccessful completion of a process. You are able to start subsequent processes based on this type of event. Definition: An event chain is a collection of events that have been completed successfully and independently of one another and to which the background processing system reacts . Use : You arrange events into an event chain in the Administrator Workbench.If all of the events in the event chain are completed successfully, a success-event is triggered. You specify this success-event in the subsequent processing of the event chain.The start of this event can in its turn trigger other processes. • Specify a name - Choose Create Event Chain. • Assign an event type (successful or with errors). • Specify parameters (for example, job number, job name). 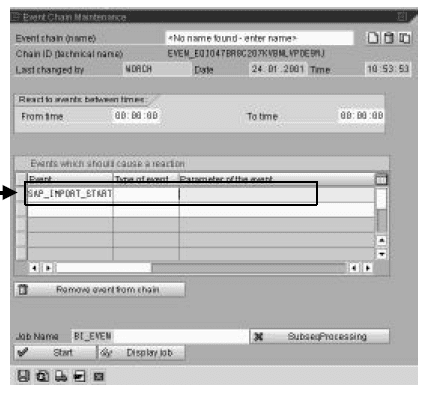 are events with errors in the event chain. • Save the event chain. If, in the chain, you decide on one event that you want the system to trigger if its triggering-event is not completed successfully, and this event is triggered, it is triggered for the whole chain. • Administrator Workbench (BW) - Tools- Event Chain Processing. • Choose the Subsequent Processing option, and decide which event you want the system to trigger in the case of successful completion, and which event you want to be triggered if there are events with errors in the event chain. • Save the event chain.If, in the chain, you decide on one event that you want the system to trigger if its triggering-event is not completed successfully, and this event is triggered, it is triggered for the whole chain. Prerequisites:Under Tools - CCMS - Jobs - Maintain Event, you have determined the events that you want to use in an event chain and in the subsequent processing of the event chain. 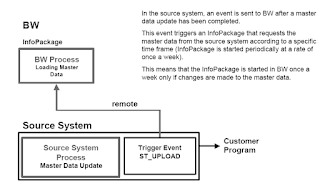 A process in BW is triggered by an event or by a transaction.When a process is complete (for Example, data has been loaded using an InfoPackage) a second event can be triggered (using the Subsequent Processing button) that in turn triggers a third process, and so on. 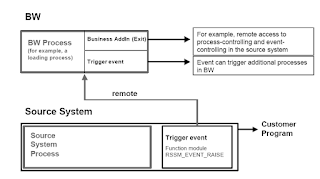 The resulting sequence of events is called an event chain.A source system can also be accessed remotely by a Business AddIn (User-Exit) that subsequently controls an event or triggers a process in the source system. 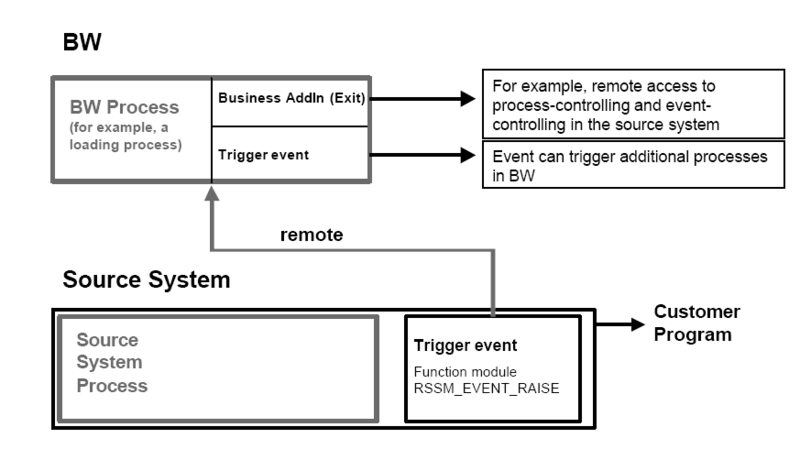 A process in the source system has no direct event-control over BW processes. The source process is embedded in its own ABAP program. The function module rssm_event_raise is included and executed in this program. It can transfer a process to the BW. You can specify a time delay for the procesing of an InfoPackage in BW. See the examples on the next slide.Instead of using an event, a BAPI (InfoPackage_Start) can also be called in the source system. It controls an InfoPackage in the BW directly. However, with this method you do not have the option of completing the process control in the BW. 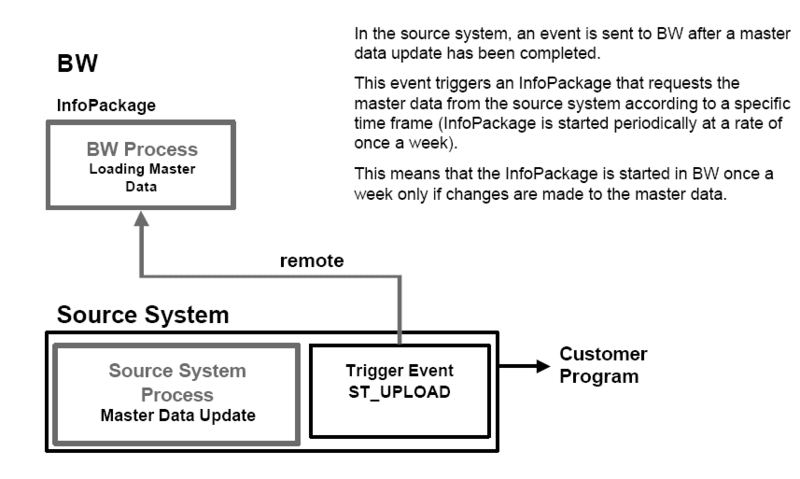 In the source system, an event is sent to BW after a master data update has been completed.This event triggers an InfoPackage that requests the master data from the source system according to a specific time frame (InfoPackage is started periodically at a rate of once a week).this means that the InfoPackage is started in BW once a week only if changes are made to the master data.